Whale Watchers Inn is situated on the Whalecoast and is surrounded by two natural phenomena - The Breede River Estuary and the Ian Ocean. Endless, white sandy beaches are available for that long stroll and the San Sebastian Bay, which Whale Watchers Inn overlooks, is the home of the Southern Right Whales who can be viewed either from the beach, or from your balcony. 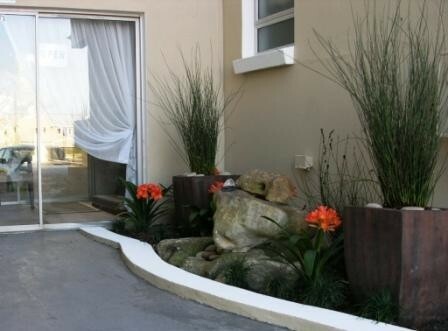 The perfect half-way stop between Cape Town and Knysna situated at the mouth of the Breede River alongside beautiful uspoilt beaches, offering B&B and self-catering accommodation in a home from home atmosphere. Whale Watchers Inn is situated approx. 100m from the beach and within easy walking distance of the mouth of the Breede River where visitors enjoy swimming, boating, fishing, wind and kite surfing. San Sebastian Bay, also known as "THE WHALE NURSERY OF SA", comes alive between July and November with the activities of a large concentration of Southern Right whales and their young. Whale Watching from our balcony or the beach is very popular. Whale Watchers Inn offers 5 Bed and Breakfast rooms and 5 family units with self catering facilities which have the extra option of enjoying our full country breakfast. These units are fully equipped and serviced daily. TV's, fridges and tea/coffee making facilities area in all of our rooms. Wheelchair friendly accommodation available. Children are welcome. Credit Cards accepted. Guests area able to relax in the quiet of our garden where children can play safely. Braai facilities available. Come and enjoy true old fashioned hospitality away from the pressures of our modern day living!